Berggruen Gallery is pleased to present an exhibition of new paintings, drawings, and a recent film entitled “Finite and Infinite Games’’ (2017) by American painter and filmmaker Sarah Morris, on view January 11 – February 17, 2018. This exhibition marks the artist’s first solo show on the West Coast. The gallery will host a reception for the artist on Thursday, January 11 from 5:00 to 8:00 p.m.
Morris is widely recognized for her large-scale, graphic paintings and drawings that respond to the social, political, and economic force of the urban landscape through a visual language grounded in bold and ambitious abstraction. Her probing of the contemporary city inspires a consideration of the architectural and artistic climate of modernity and humanity’s footprint—a subject that Morris energizes and invigorates through a distinct use of geometry, scale, and color. Her work straddles the boundary between abstract and representational. Systems and structures of power emerge from Morris’s perceptions of her urban surroundings—Hamburg, Rio de Janeiro, New York, Los Angeles, Beijing—cities of persistent physical and cultural transformation. As she proposes, navigating the modern world involves transgressing spaces of private authority—a persistent line of inquiry that runs throughout her body of work. Using glossy house paint, Morris captures the vibrant and energetic nature of the modern city through her continual exploration of bright, lively colors and stirring geometric patterns. In this show, an underlying pulse exists throughout the artist’s paintings, as she explores visual embodiments of sound waves, sound graphs, and digitized movements through two-dimensional picture planes. Asymmetrical grids form futuristic compositions of sharply delineated shapes separated by rigid borders and acute transitions between colors. The grid-like quality of her work evokes city plans, architectural structures (including a staircase designed by Paul Rudolph), tectonic plates, or industrial machinery. Paring down structures of power to their formal elements, Morris’s work acts as a catalyst for creative exchange between art and architecture while simultaneously exploring the socio-political landscape of modernity and its rigid systems of power and control as well their failures. Her inspirations range from Oscar Niemayer and Joan Didion to lunar cycles and birdcages—a unique blend of creative voices and forces of nature. This exhibition also includes one of Morris’s recent films, “Finite and Infinite Games” (2017). Featuring German theorist, writer, and filmmaker Alexander Kluge, Morris’s film uses the Elbphilharmonie as a site to navigate an individual’s space, history, and narrative. Interweaving the voice of Kluge, the text of James P. Carse, and Morris’s own voice, “Finite and Infinite Games” proposes a dialogue between Morris and Kluge, freedom and finitude, rules and possibilities. The inclusion of the artist’s film reflects Morris’s notion of her painting and cinematography as inherently connected, synchronously forming a dynamic body of work encompassing a variety of media. Through her films, Morris continues to explore the psychology of a place and the systems and structures of control that are embedded throughout its physical and cultural environment. As she enters spaces that appear withheld from artistic intervention, Morris captures the complex and contradictory nature of the modern city and humanity’s footprint, revealing the central role of art as a nexus of time, civilization, and place. 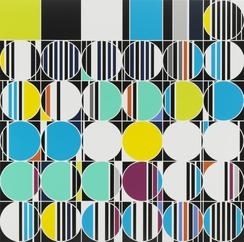 Sarah Morris was born in Kent, England in 1967. She earned a B.A. from Brown University in 1989. Morris also studied at Cambridge University in 1988 and participated in the Whitney Independent Study Program from 1985 to 1989. Her work belongs to numerous museum collections including the Pompidou Centre, Paris; the Dallas Museum of Art, Dallas; the Louis Vuitton Foundation, Paris; the Solomon R. Guggenheim Museum, New York; the Museum of Contemporary Art, Los Angeles; the Museum of Modern Art, New York; the Tate Modern, London; the Yale Center for British Art, New Haven; and the Victoria and Albert Museum, London. Morris was the recipient of the Philip Morris Award from the American Academy in 1999, and she also earned the prestigious Joan Mitchell Painting Award in 2001. Morris lives and works in New York. Sarah Morris, January 11 – February 17, 2018. On view at 10 Hawthorne Street, San Francisco, CA 94105. Images and preview are available upon request. For all inquiries, please contact the gallery by phone (415) 781-4629 or by email info@berggruen.com.